Midnight Blue tells the story of Bonnie, whose fragile happiness with her mother is under threat. With the help of new-found friends, Bonnie finds a world beyond the sky, where she faces challenges and choices which could change her life forever. 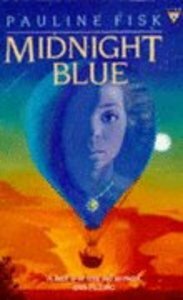 - Publisher Bonnie, a girl torn between the harsh reality of her mother's weaknesses and her grandmother's strong will escapes her home one day by sneaking into her neighbor's hot air balloon. But instead of flying into the clouds and back down, she lands in another world, something like her own, but both kinder and somehow much more terrifying. She's not sure if she can ever leave this nearly parallel world and return to her own. And if she did, she isn't sure she'll be able to bring back with her the sense of warmth and love she has grown to cherish. Amazingly, she does both.